This DIY explains how to test the solenoids for the VFAD, AIR, SSV, and VDI. 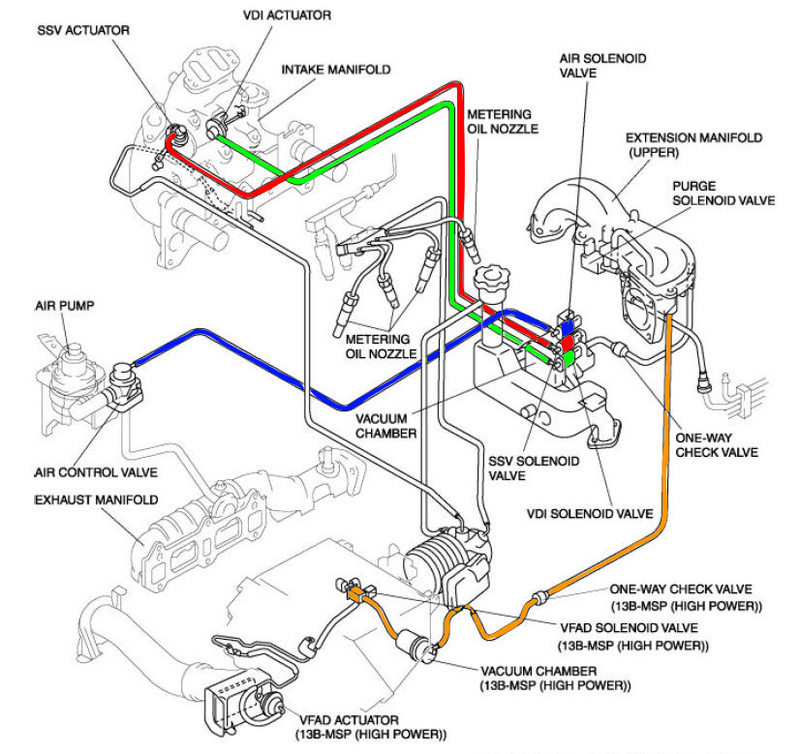 The Mazda Service Manual explains this procedure clearly, but I still get asked how to perform this. 1) Once you get the solenoid removed you should clean the top port with soap/water or isopropyl alcohol. This is where you are going to blow into with your mouth to verify airflow. 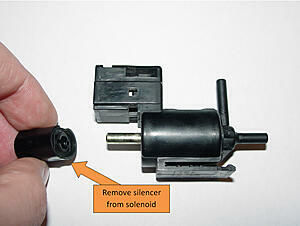 2) Remove the silencer for the solenoid by simply pulling it out. This will expose another port. 3) Blow into the top port and verify the airflow is directed towards the "silencer side". 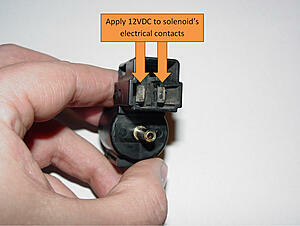 4) Apply 12VDC to the electrical contacts to energize the solenoid. I used an old 12V transformer that I had laying around (could have been to a telephone) and cut/exposed the wires. You can always get one from Radio Shack if you don't want to hack one up. Its good for troubleshooting other devices like small motors. I attached quick-disconnect terminals to the wires so I could plug them onto the contacts (better than having to hold the wires and blow into the port). 5) With 12VDC applied, blow into the top port and verify the airflow got redirected towards the other port. 6) If the airflow did not match as instructed or if it came out the same port with it energized and not energized, replace the solenoid. If it tested OK, simply reinstall. Last edited by Jon316G; 06-18-2011 at 07:53 AM. VFAD? We don't need no steeekin' VFAD. Excellent insight, as always Jon! I'm going to test the valves with a hand pump tomorrow..
Old thread but great DIY..
What else would one check after coils test ok with 12v and coil connectors have 12v. Stumped. 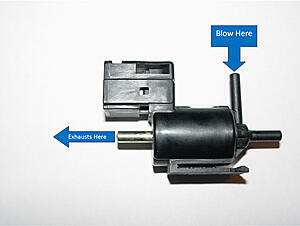 The item in question are the three solenoids, if you are asking about coils, you are in the wrong thread. I just replaced mine when the air valve solenoid failed even after the tests. Which CEL(s) triggered that lead you to check the solenoids? My bad. All 3 solenoids work with 12v applied. I have 12v at the connectors with key on. I still get p2259 code coming up. If you have the time, try flipping the solenoids and see if the CEL changes with the switch or stays the same. The switch has been done with mixing all 3 soleniods. At what point I'm I to get vacuum to the air check valve, ssv, and vdi. The only time I get vacuum is when I turn my car off. Is this right? My thought was with 12v power at the connector for each solenoid I would have vacuum all the time. its the atmospheric pressure sensor, it needs to sense atmosphere, so it has that short length of vacuum line on purpose. Thanks for the DIY. Found my bad solenoid this weekend, and replaced it. Sorry to dredge up this post, but this saved me quite a bit of money. It's my SSV itself that's stuck. The solenoids work just fine. these solenoid often tests fine when cold, but fails when its HOT, which is the most common operating conditions these solenoid sees everyday. so I usually heat it up with a hair dryer first before I test them. Ah, okay. So P0661 and P2259 are entirely related to the solenoids, correct? So even though they tested out just fine, they might be faulty still as they were cool? Anyone know how to fix it and where can I get the parts ,btw, I'm in Vancouver BC. --- -I hate going to the dealer ... much appreciated ! 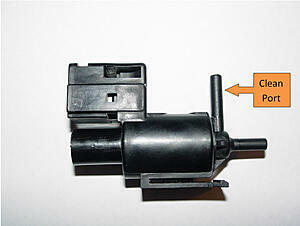 P2259 is easily fixed with a new solenoid (rarely the contact just need to be cleaned). This may also fix P0410. Getting to the solenoid is simple enough. It's mounted to a vacuum reservoir on the back side of the upper intake manifold. There are three solenoids back there so finding the right one may be tough. 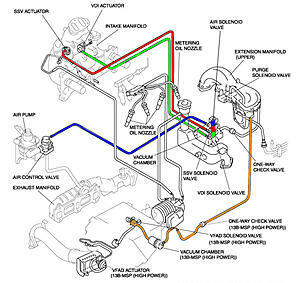 Follow the vacuum hose from the air pump, under the UIM, to the solenoid. It's theoretically possible to remove the solenoid without removing the UIM but it's a royal pain in the ***. It will be faster to remove the airbox, throttle body, and UIM to get to it. Much appreciated for your kind reply! Sorry I'm very new to rotary engine... How many of them? Do I need replace them all? Is there any way just cleaning it? Btw. If someone could provide a diagram of picture of the selinoid ofmy RX8, that would be wonderful and highly appreciated! P2259 is an electrical code. It's possible that cleaning the electrical connector may fix it but odds are the solenoid needs to be replaced. There are three mounted to the back of the UIM. You only need to repair/replace the one that connects to the air pump vacuum actuator. 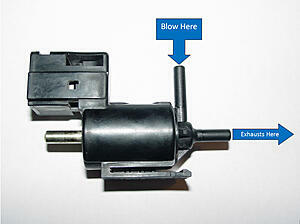 Just trace the vacuum hose from that actuator to the correct solenoid.